Are you a goth as HELL 100% cutie with a booty? 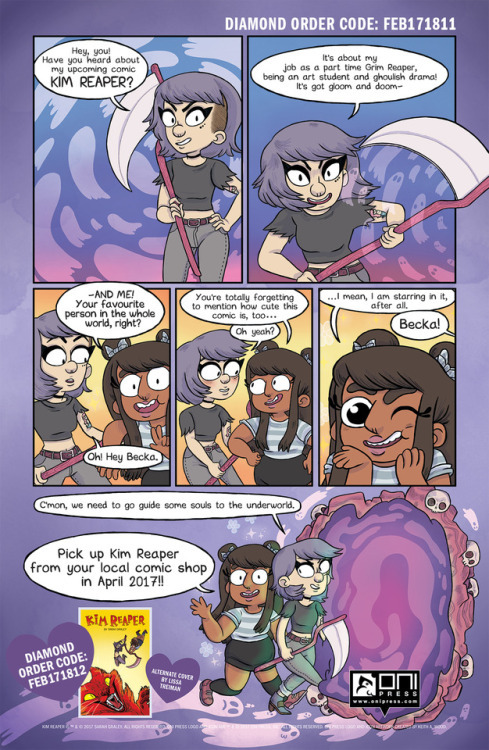 Then don’t miss out on KIM REAPER #1 by @sarahssketchbook , in comic shops April 5! Ask your comic shop to pre-order KIM REAPER #1 by Monday, March 13! Give this Diamond order code (FEB171811) to your comic shop retailer so they can easily look up and reserve a copy for you! Want the CATastrophic alternate cover illustrated by Giant Days artist @lissabt ? Give this Diamond order code (FEB171812) to your comic shop retailer! Find your local comic shop with findacomicshop.com or comicshoplocator.com and add KIM REAPER to your pull list so you never miss out on an issue!